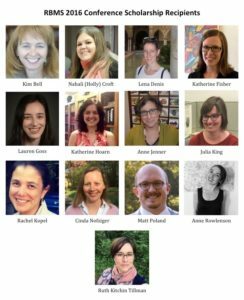 Each year, RBMS offers scholarships to first-time RBMS Conference attendees in the hopes of introducing recipients to the Section, encouraging participation, and fostering greater diversity in RBMS and the profession. This year, 14 exceptional individuals received this scholarship and will be joining other conference attendees in Coral Gables for what promises to be a stellar week of learning and community-building. Kim Bell is the Services Coordinator at W.D. Jordan Rare Books and Special Collections, Queen’s University Library, where she provides reference help, web support and social media posts, among other duties. She also transcribes exams into Braille for the University. Kim holds a degree in political science from Queens’s and is currently working on a follow-up article to her recent exhibit on prison newsletters. She is looking forward to connecting with and learning from other RBMS attendees in Coral Gables. Nahali (Holly) Croft graduated from the University of North Carolina at Chapel Hill in May 2016 with an MSLS, Archives and Records Management Concentration. She also completed a Certificate in Nonprofit Management. Beginning July 1st, she will be the Digital Archivist at Georgia College and State University. Her undergraduate degree is an AB in English from the University of Georgia. Between the two degrees, she worked on Capitol Hill and for political campaigns for a decade. Lena Denis graduated in May from the Simmons College School of Library and Information Science, and holds a previous master’s degree from the Courtauld Institute of Art. She works at the Boston Athenæum and at the Harvard Library. Her focus is on digitization of cultural heritage, with particular interest in digital stewardship and user-based design. She can’t wait to meet people with expertise in these fields and learn from them at the conference! Katherine Fisher is an MLIS student at the University of Hawai’i at Manoa and works as a digital publishing assistant at the University of Hawai’i Press. She holds a PhD in English Language and Literature from the University of Michigan and hopes to use her research and teaching experience as a reference and outreach librarian in an academic special collections library. She’s thrilled to have the opportunity to attend the RBMS conference and looks forward to meeting and learning from professionals in the field. Lauren Goss is an MLIS student at San Jose State University and works as a graduate student assistant at the Oregon State University Special Collections and Archives Research Center and as a film archives assistant at University of Oregon Special Collections and University Archives. In 2011, she graduated from the Robert D. Clark Honors College (University of Oregon) with a B.A. in History. She is looking forward to attending a variety of conference sessions and networking at the social events. Katherine Hoarn is the Visiting Rare Book & Instruction Librarian at Florida State University. She has a BA in English from Northeastern University (2011) and an MA in Library and Information Science from Florida State University (2015). She enjoys reading about the history of printing, studying historic bookbindings, and getting undergraduate students excited about interacting with special collections materials. She is looking forward to meeting so many people who love rare books as much as she does! Anne Jenner is Pacific Northwest Curator in Special Collections at the University of Washington Libraries in Seattle. She holds an MA in Scandinavian Languages and Literature from the University of Washington and an MLIS from the University of Illinois Urbana-Champaign. Anne previously served as Head of Library and primary cataloger of a Swedish language special collections at the Swenson Swedish Immigration Research Center, and as director of Archives and Special Collections at North Park University. Julia King is a recent graduate of the University of Toronto’s Faculty of Information and a Toronto Academic Library Intern at the Thomas Fisher Rare Book Library. Her research interests are in outreach and the intersection between early printing and medieval manuscripts. In her spare time, Julia is a letterpress printer at the Massey College Bibliography Room. She is looking forward to meeting librarians and peers from across the country and wants to try a real Cubano in Miami! Rachel Kopel just graduated from the University of Washington with a Master’s in Library and Information Science. Her undergraduate degree is in Graphic Design with a minor in Book Arts. She is particularly interested in knowledge organization and working with archives and special collections. She recently started a 12-week internship as a Metadata Specialist for Vulcan Inc. in Seattle, and in her spare time, she is also a bookbinder and a letterpress printer. Cinda Nofziger is the Archivist for Academic Programs and Outreach at the Bentley Historical Library. With more than ten years teaching experience at the University level, she facilitates learning opportunities in the archives for students and others. She holds an MSI from the School of Information, University of Michigan, and a PhD in American Studies from the University of Iowa. Her archival research for her dissertation inspired her to a career in archives. Matt Poland is a PhD student in Renaissance Literature and Textual Studies at the University of Washington. His research focuses on how library history and collection practices affect literary interpretation. Matt holds an MSIS from UNC Chapel Hill and an MA in English from the University of York. Matt loves using special collections in his teaching, and wants to find ways not only to digitize the humanities, but to develop new types of inquiry that can be performed using rare and archival materials. Anne Rowlenson is pursuing her MS in Library and Information Science with a concentration in Rare Books and Special Collections at Long Island University’s Palmer School. Before this degree, she earned her BA in Music and English in 2014 and an MA in Bibliography & Textual Studies in 2015, both from the University of Virginia. Anne has worked for the Rare Book School in Charlottesville, Virginia, as an office assistant and summer staff member since 2013. She currently assists a book dealer in Manhattan. Ruth Kitchin Tillman is the Digital Collections Librarian at the University of Notre Dame’s Hesburgh Libraries. She earned her MLS from the University of Maryland’s iSchool and previously worked as the Metadata Librarian at the NASA Goddard Library. Her interests include metadata and linked data, strategies for automation or streamlining of digitization processes, and sustainable methods of handling digitized objects. She is looking forward to learning more about collaborative work inside and outside the library ecosystem. 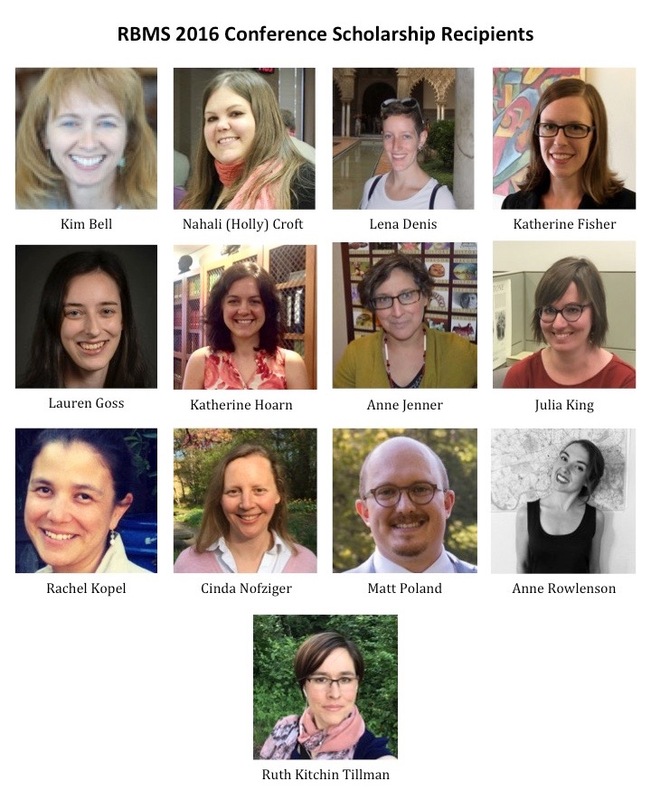 If you see any of these scholarship recipients at the conference, please join us in congratulating them on their achievement and welcoming them to the community!